The Hospital's medical staff were organised on national lines, with contingents from Great Britain, Canada, Australia and New Zealand. Each detachment removed its records after the war. It was assumed that the British records had been donated to the Royal College of Surgeons and destroyed when the College was bombed in the Second War; the Canadian records have disappeared. The New Zealand records (the Macalister Archive) resurfaced when rescued from imminent destruction by Sandy Macalister,Professor of Oral Surgery at the Dental School in Dunedin, and he generously donated them to us in 1989. After publication of a brief article about these in 1993, the extant British records (the Gillies Archive) emerged from hiding at Queen Mary's Hospital, Roehampton, where they had languished, almost untouched, since 1925. 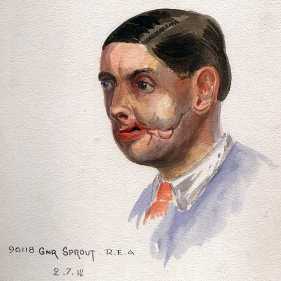 They include many cases illustrated by Gillies in his seminal textbook, "Plastic Surgery of the Face", published in 1920. Altogether the archives contain over 2500 records. Most of the casenotes are in their original folders and contain notes, photographs, diagrams and X-ray photographs. 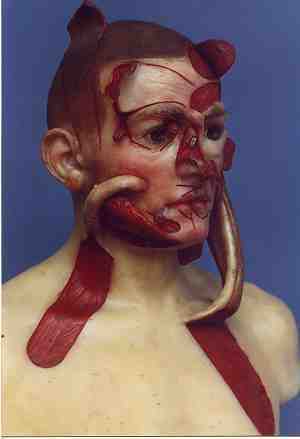 The New Zealand records also contain a series of 98 watercolours and a life-sized wax model illustrating surgical techniques. 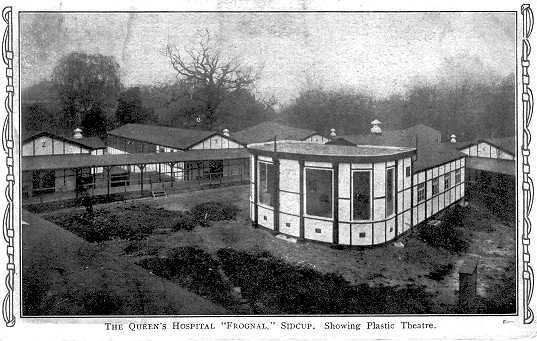 Queen's Hospital patients of this era were almost exclusively servicemen. 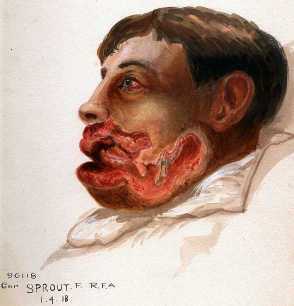 Most were soldiers, with a small number of Navy and Flying Corps personnel, most of whom had suffered burns. The records include rank, number, regiment and date of wounding so that the action in which they were wounded can often be identified. A proportion of the Sidcup records were transferred to the Royal College of Surgeons, London in 1923. These had formed the Facial Museum established at Sidcup. All were destroyed when a bomb hit the College in 1941. Thus the records from Roehampton represent, we believe, about half of the total number of patients treated by the British Section. The Gillies and Macalister Archives are listed alphabetically and record the extant contents of the notes. The two are cross-referenced and also list whether other material is held elsewhere. The British and New Zealand notes are now in the Royal College of Surgeons, London. The Australian section's records are deposited in the archives of the Royal Australasian College of Surgeons, Melbourne. The Canadian records have vanished, although an Admissions Book survives in the Canadian National Archives. From this I have been able to reconstruct a list of names and I am most grateful to Paul Ferguson for his work on locating the full army files for these names. It transpires that they contain some of the missing medical details but we have as yet not evaluated them fully. The Gillies and Macalister Archives are probably the most important and complete collection of facial surgery records of their age in the world. They are available to researchers by application to Louise King at RCS. In addition the WW1 records have recently been fully digitised, and details are available through the family history website findmypast. A summary service is now available on that site and the coordinator, Paul Nixon, has added more first names to the outline in the spreadsheet below. Much of the important and representative archive material has been reproduced on film or digitally, and Dr Bamji is available to lecture worldwide on the subject of facial injury in the Great War. Requests should be addressed direct to him preferably by email. a list of Canadian names (which includes a small number for whom notes survive within the British Section notes) compiled from a list of material listed in the shipping manifest of 1919. All the Canadian notes have been lost; however, in September 2012 I discovered that the Section's Admissions book was in the Canada National Archives. From a copy I have managed to expand the details of the men treated at Sidcup. The Canadian Archives have also been digitising all their files, and the future of a number of the Canadian patients is now on line there. I am most grateful to Paul Ferguson for this information. As we hear of men treated at Sidcup, but for whom no notes exist, this database will be expanded. To download the spreadsheet click here. 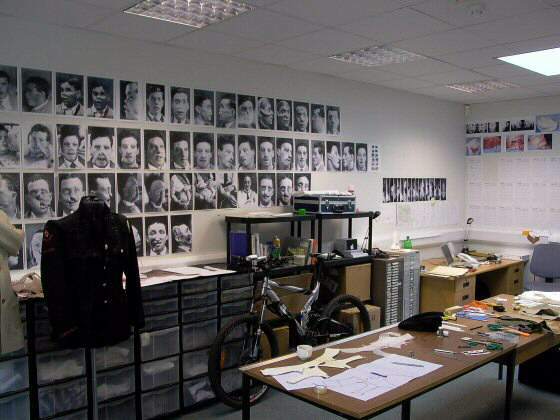 The archives collaborated with the artist Paddy Hartley in Project Facade, an exciting venture responding to the images of facial reconstruction from WW1. 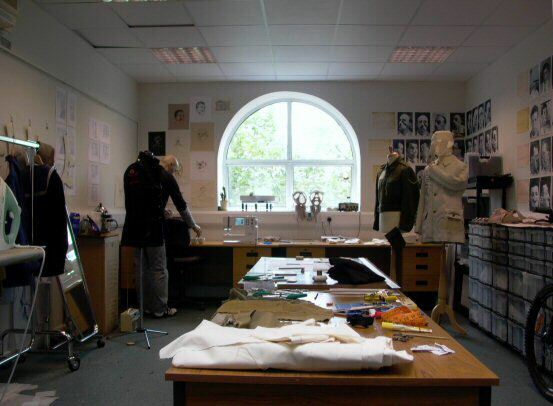 Below are two views of Paddy's studio in St Thomas's Hospital, and one of the experimental works he has made, creating a dramatic needlepoint image from a photograph. The original 84 Macalister watercolours have been digitised; subsequently another 13 came to light and are included in this updated gallery. Drawn on Whatman art board, they have faded somewhat and I have corrected the colour balance just a little. En masse they can be somewhat daunting; below are two images as an example. 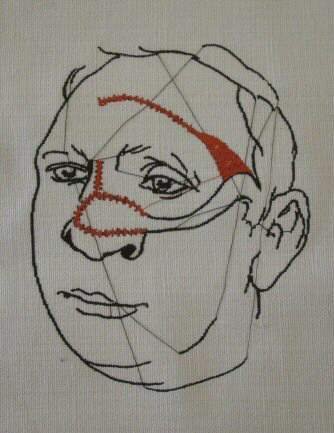 Please note that these images are now copyright of the Royal College of Surgeons of England. A further series of watercolours remains in the Hocken Library, University of Otago in Dunedin, New Zealand. I had the pleasure of seeing them on my lecture visit. Some are duplicates of those in the Macalister Collection but there is a series of Percy Green which complement the three we possess. Review of the watercolours suggests that, apart from those done by Daryl Lindsay, most were by Herbert Cole, who returned to New Zealand and later painted under the name Rix Carlton. There are also some postcard sized, very detailed watercolours done for Henry Pickerill's book. Altogether an additional 32 watercolours can be added to the total. This gallery contains the pastels created by Henry Tonks at Aldershot and Sidcup. The images are copyright of the Slade School and the Royal College of Surgeons and are watermarked accordingly. Comparison with the Macalister collection is interesting; the quality of the portraiture is quite different, with only Daryl Lindsay of the New Zealand section artists coming anywhere near Tonks in his portrayal of mood. I am grateful to the College for allowing us to upload the RCS images. The clinical archive at Queen Mary's was supplemented by an extensive collection of books relating to surgery and medicine of the Great War, which includes a number of textbooks as well as personal reminiscences, hospital journals and general history books. The collection contains books from Great Britain, the USA and Canada, France, Germany and Belgium and is probably the largest library of WW1 medical experience in the world. A copy of my bibliography (76 pages in all) may be found on this site; it's big (file size just over 1Mb) but once downloaded it may be copied into a blank Word document. The Library is now part of the collection of the Brotherton Library, University of Leeds. Start your search here. Susie Winter, Sir Harold's granddaughter, has donated a substantial collection of papers and records inherited through her father Michael (Mick) to BAPRAS.